Yes! Superheroes are for Real!!! For all those Batman fanatics out there, now follow his path to glorifying heroism and bring justice to the innocent! As the Mysterious Dark Knight states, “A hero can be anyone”, your junior can now easily follow his footsteps and save the society under the veil of darkness! The DC Justice League Batman Helmet makes sure that your kiddo feels exactly like the frightening and fearsome Knight of the Dark, The Batman! The design of this Batman Tactical Helmet is iconic in every sense! 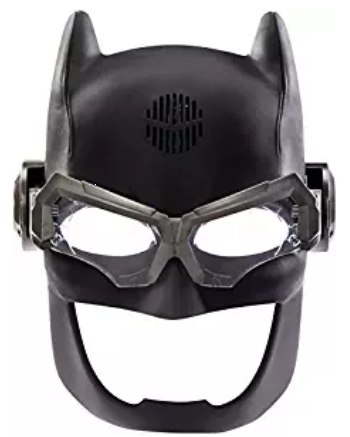 Designed from the real Bat Helmet from the Justice League movie, this helmet is an authentic DC issued entity and comes packed with pivoting, tactical visor clips that activates the edge light on flipping down, voice changer to speak like the Dark Knight himself, emits realistic combat sounds and dictates recorded phrases and music as well! So unleash the hero in your child and bestow him with the ultimate glory, the mask of Batman! The Dark Knight will rise again and this time, his foes had better run for their dear lives! Save your Justice League buddies from peril when Steppenwolf and his Para-demons decide to pay a visit and protect Gotham from the wrath of these mega-villains!